A well-known Pakistani TV anchor facing renewed accusations of hate speech is fighting a court order that temporarily bans him from appearing in print, on television or on social media platforms. Legal experts and rights activists are monitoring the case, which has raised the issue of free speech. 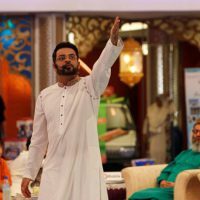 In December, an Islamabad court imposed the ban on Aamir Liaquat Hussain, a controversial yet influential TV host accused of instigating hatred and religious intolerance. A final decision is pending. Hussain — called the “king of ratings” because of the huge audiences he commands — denies the accusations and created a website on which he posted a video expressing his desire to continue exercising his right to free speech. “The voice may be banned 100,000 times. The picture is forbidden — or even giving analysis on any program is banned. But the water carves its own path,” he said. Hussain also questioned the restriction. “I have submitted a petition in the Supreme Court to intervene and to look into the decision that blocks me from appearing on television. I have no clue as to why the Islamabad High Court has placed a ban on my appearances,” Hussain said in the video. Legal experts have a different opinion, and say his decision to create the website is in open defiance of the court ban.